Medicinal herbs/plants or the herbal drugs refer to the use of plant and plant-based products for the management of common ailments. World Health Organization has defined herbal medicines as finished labeled medicinal product that contains an active ingredient, aerial, or underground parts of the plant or other plant material or combinations. In India, more than 70% of the population uses herbal medicine for their health-related problems. Many of the institutions adopt “reverse pharmacology” approach to study the clinical efficacy of medicinal plants and their pragmatic utility in healthcare. Moreover, the herbal therapeutics constitutes a major share of all the officially recognized Indian systems of medicine such as Ayurveda, Yoga and Naturopathy, Unani, Siddha, and Homeopathy (AYUSH). However, there is evidence of spurious drugs, irrational use, and adverse drug reactions of herbal drugs which should certainly be monitored with governmental patronization. Furthermore to be accepted as a viable alternative to modern medicine vigorous method of scientific and clinical validation must be applied to prove the safety and effectiveness of these herbal products. However, the clinical trial of herbal drugs is difficult owing to some of the obvious reasons. Around 20,000 medicinal plants have been identified for their medicinal properties; however, only 7000–7500 medicinal plants are being used by traditional practitioners. 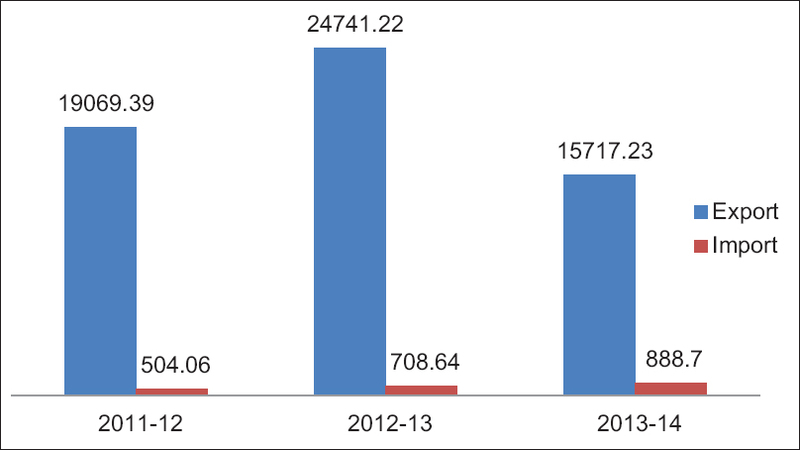 Similarly, the export of AYUSH-related items has increased from 2011 to –2012 and 2012 to –2013 and decreased in 2013–2014; however, import has been consistently increased during these years. Given this background, a brief review was carried out to assess the medicinal herbs and their development in India primarily through 5-year plan documents of India. Background: Ayurveda, the science of life, is the most ancient medical doctrine of human civilization. Some of the basic principles described in Ayurveda are still the same as today's medical science. Ayurveda does not have a specific text as epidemiology, but the principles described in piecemeal can be compiled, analyzed, and interpreted in the light of modern theories of epidemiology. Objective: An initial systematic literature review by the help of internet-based search engines revealed very negligible work in the field of Ayurveda and epidemiology. Hence, an attempt was made to analyze various principles of Ayurveda relevant to epidemiology and interpret their contemporary significance. Methodology: The work is mainly based on theoretical research using standard textbooks of epidemiology and classical treatises of Ayurveda. Discussion: A good number of principles are found in the classical texts of Ayurveda, which can be compared with the concepts of epidemiology. In the process of theoretical analysis, the following concepts were found relevant, such as the concept of causation of disease/Etiology of disease, causes of epidemic, classification of disease, modes of communicable disease transmission, and natural history of disease. In this study, attempt has been made to understand these concepts in the light of epidemiology with their most approximate delineation. However, being a classical medical doctrine, it has its own appeal that cannot exactly be compared with the concepts of epidemiology. Conclusion: It is interesting to note that the tenets described centuries back are very much relevant at this present era, and their importance cannot be neglected. A change from stable population with high fertility and mortality to a new stability in population due to low fertility and mortality patterns is referred to as a demographic transition. The pace of India's population has slowed in the past few decades; and in the coming years, India will have a large proportion of people in the working ages. Optimists have argued that the resulting demographic dividend (or bonus) will create a smaller dependency load and will generate opportunities for economic growth. On the other hand, the pessimists have stated that India is indeed heading towards a demographic dividend, but challenges exist for economic prosperity if India's policies are not geared towards productive employment for this large working age cohort. Aim: This study sought to determine the prevalence and characteristics of Attention Deficit Hyperactivity Disorder (ADHD) in children with idiopathic epilepsy (CWE). 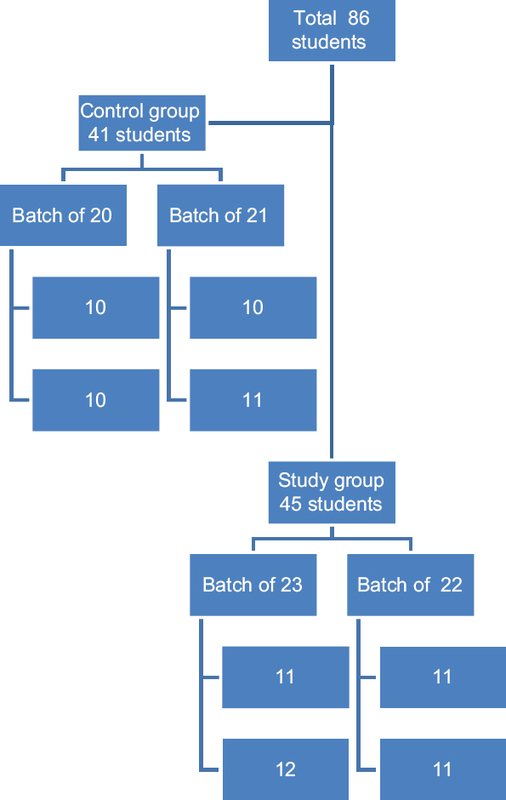 Methodology: Purposive sampling was done to select 94 children with idiopathic epilepsy. These children were administered the Abbreviated Conners Scale to screen for ADHD, which was then confirmed using DSM 5 diagnostic criteria. Results: 23.4% of CWE were found to have comorbid ADHD, compared to 3-5% in the general population. The characteristics of ADHD also differed in our sample as compared to the general population. Conclusion: The findings of our study can help make diagnosticians more astute to identify ADHD in CWE. Background: In the present investigation, tamoxifen-loaded liposomes transdermal patch was formulated using eudragit-RL, hydroxypropyl methyl cellulose K-50, and ethyl cellulose. Materials and Methods: Liposomes were formulated by solvent evaporation method using poly (sebacic acid-co-ricinoleic acid) in varying ratios and evaluated for particle size, drug loading, entrapment efficiency, transmission electron microscopy, differential scanning calorimetry, and X-ray diffraction. Formulated tamoxifen-loaded liposomes were finally incorporated into transdermal patch and evaluated for thickness drug content, moisture content, moisture uptake, folding endurance, tensile strength diffusion coefficient, permeability coefficient, in vitro permeation, and skin irritation. 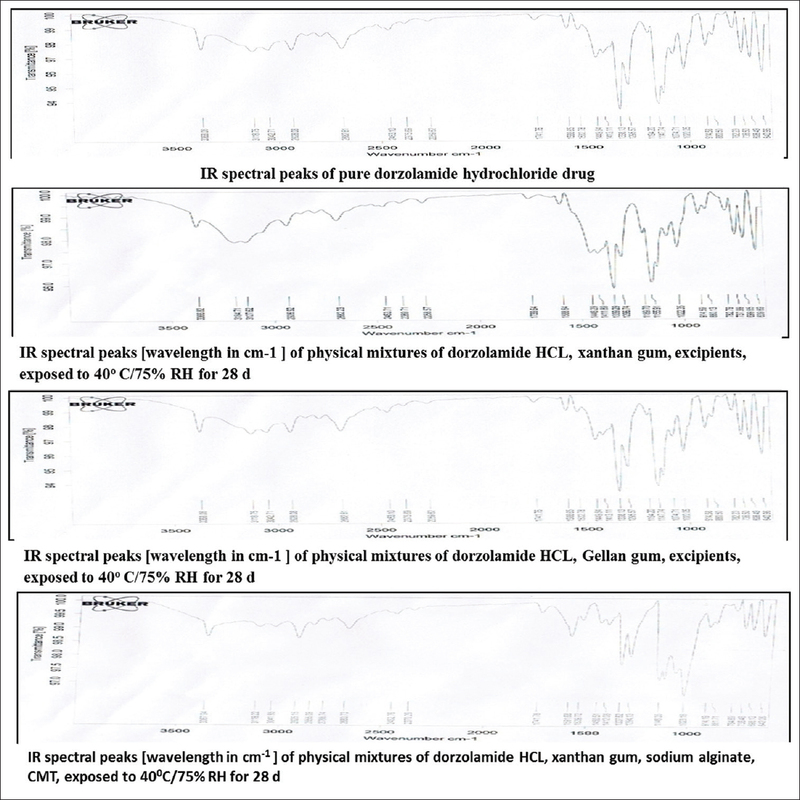 Optimized transdermal patches were tested for its pharmacokinetic and pharmacodynamics parameters Results: Formulated transdermal patches showed improved bioavailability of tamoxifen when compared to its oral route. Conclusion: Tamoxifen-loaded liposomal transdermal patches could serve as a better alternative to existing marketed formulation in terms of bioavailability. Background and Objectives: Appendiceal stump closure during laparoscopic appendectomy (LA) is an important step. 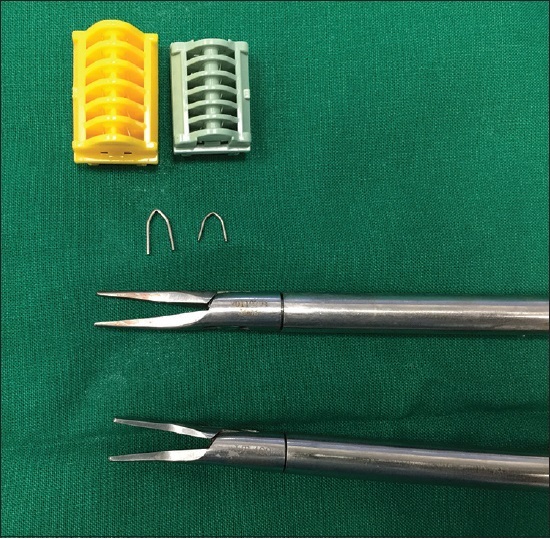 This study was an attempt to evaluate the ease of use and safety of titanium clips compared to Roeder's knot in the appendiceal stump closure in patients undergoing LA by comparing complications (intraoperative and postoperative), hospital stay, and follow-up period. 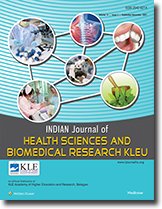 Materials and Methods: This 1-year randomized controlled trial was done in under the Department of General Surgery, KLES Dr. Prabhakar Kore Hospital and Medical Research Centre, Belgaum from January 2014 to December 2014. A total of 60 patients were divided into two groups of 30 each that is, Group R (Roeder's knot using silk suture and Group T (titanium clips). Results: In this study 53.33% of the patients in Group R were females as compared to 36.67% in Group T (P = 0.795). The mean age in Group R was 29.77 ± 11.24 years and in Group T, it was 29.53 ± 8.96 (P = 0.929). Other preoperative characteristics of the study population in Group R and T were comparable (P > 0.050). Significantly higher number of patients (60%) in Group T required lower operative time (45–60 min) compared to Group R (83.33% patients required 61–75 minP< 0.001). The pressure gradient was 1 in 23.33% of the patients in Group R compared to 56.67% in Group T (P < 0.001). The mean operative time, pressure gradient (the difference between the initial pneumoperitoneum pressure and the pressure during clip/knot application), and hospital stay were significantly high in group R compared to Group T (P < 0.050). However, the intraoperative complications (P = 0.177), postoperative complications (P = 0.303), and follow-up period in both the groups were comparable (P > 0.050). Conclusion and Interpretation: Appendiceal stump closure with titanium clips is advantageous in terms of operative time, pressure gradient, and offers early resumption of daily activities. Introduction: A major problem in ocular therapeutics is the attainment of optimum drug concentration at the site of action, which is compromised mainly due to precorneal loss resulting in only a small fraction of the drugs being absorbed. The effective dose administered may be altered by increasing the retention time of medication into the eye by using in situ gel forming polymeric systems. Materials and Methods: In the present investigation, an attempt has been made to design, formulate, and evaluate in situ gelling-based ophthalmic drug delivery system dorzolamide hydrochloride to enhance the precorneal retention and to improve the ocular bioavailability. In situ gel formulations are designed using carboxy methyl tamarind, a polysaccharide, was used with other natural polymers such as xanthan gum, gellan gum, and sodium alginate. The in situ gel formulations were characterized for physicochemical characters, namely physical appearance, pH measurement, gelling capacity, drug content estimation, rheological study, effect of sterilization on the viscosity, in vitro diffusion study mucoadhesive strength, sterility testing, preservative efficacy testing, isotonicity testing, and ocular irritation testing. Results and Discussion: The developed formulations exhibited sustained release of drug from formulations over a 9 h period, thus increased residence time of the drug. Effect of sterilization was studied to check the rigors of sterilization on the viscosity of the formulations. In the study, two optimized formulations were selected on the basis of ability to form good gelling with increased viscosity with a slow and prolong in vitro drug release pattern. The formulations were found to be nonirritating with no ocular damage or abnormal clinical signs observed. Conclusion: Therefore, the developed ophthalmic in situ gel by virtue of its prolonged corneal residence time and sustained drug release could be considered a viable alternative to the conventional eye drops formulation in achieving enhanced bioavailability. Background: Balance is a complex process which involves reception and integration of sensory inputs followed by planning and execution of movement to achieve upright posture. Vision is one of the most important senses that contribute for maintenance of balance and to explore wide range physical activities, termed as fundamental motor skills. Due to compromised vision, children with visual impairments may have fear of fall which in turn leads to reduced physical activity. Objective: To find the relationship between static and dynamic balance with fundamental motor skills in children with visual impairments. Methodology: This was a cross-sectional study done in visually impaired children including completely blind and partially blind children (n = 175) between the age group of 6–16 years from two special schools. Static balance of children was measured on balance error scoring system (BESS) and stork balance stand test (SBST) followed by assessment of fundamental motor skills, i.e. kicking and jumping on adapted physical education assessment scale (APEAS). Results: Statistically significant, weak negative correlation was found between BESS scores on firm and foam surface with kicking (r = −0.3962) and jumping (r = −0.4131) activity on APEAS (P = 0.0001). Nonlinear correlation was found between SBST and Fundamental Motor Skills (FMS) (r = 0.4482) withP= 0.007. Conclusion: There is no correlation of static balance with fundamental motor skills in children with visual impairments. Context: The knowledge of basic fundamentals of Dravyaguna such as Rasa, Guna, Veerya, Vipaka, and Prabhava helps in the proper selection of the drugs for the treatment of the diseases. 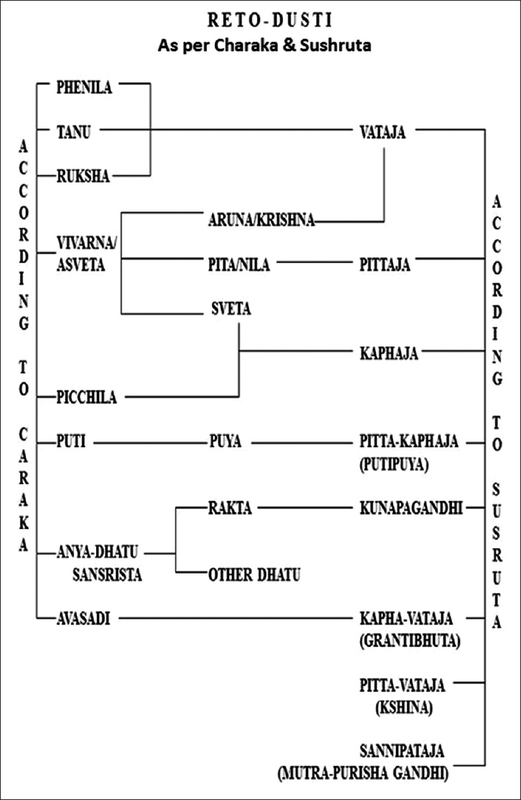 Acharyas had given simple characteristics to identify the Rasas. These characters can be useful to determine the Rasa of the unknown drugs by designing a special proforma. Aim: To revalidate individual characteristics of Rasa mentioned in the classical text with known, classical drugs mentioned in the Madhuraskandha, using structured proforma in healthy volunteers. Settings and Design: The study was planned with single-blind method in 200 healthy volunteers using 10 sample drugs of Madhuraskandha. The analysis of the taste perception had been performed through characteristics of individual tastes as well as direct identification of the taste. Subjects and Methods: The 10 drugs were selected from Madhuraskandha.The drug was administered in powder form up to 1–20 g healthy volunteers for each drug (sample size: 20 ×10 = 200). The responses after the intake of drug were noted down in structured proforma. Data Analysis Used: The answer (Yes/No) obtained for each characteristic perceived and judged by each volunteer were analyzed. Results: The volunteer's taste perception with the help of proforma showed similarity with the Rasa mentioned in the lexicons, except for Atibala, Eranda, Gokshura and Jivanti sample. These samples showed the presence of Tikta and Lavana Rasa, respectively. Conclusions: The Rasa is the only attribute which is perceivable practically, such an attributes can be evaluated precisely by this proforma which may serve as an authentic assessment for Rasa. Background: Blood transfusion service is a sensitive issue as it is covered by “Drug and Cosmetics Act” and has legal implications. Strict criteria are followed while selecting a donor so that proper blood free of all pathogens is available for recipient. Aim: To study seroprevalence of transfusion-transmitted major infections (HIV, hepatitis B virus [HBV], hepatitis C virus [HCV], syphilis, and malaria) among blood donors at a Tertiary Care Government Hospital Blood Bank in North India and to compare positivity of markers of these infections in voluntary and replacement donors. Subjects and Methods: This study was conducted over a period of 5 years (July 2010–June 2015). A total number of donors screened during this period was 130,920. Samples were tested for HIV, HBV, HCV, syphilis, and malaria and retested if found positive by third generation ELISA tests (HIV, hepatitis B surface antigen [HBsAg], HCV). Comparative analysis was done using Chi-square for linear trend. Comparison between prevalence rates among voluntary and replacement donors was done using Chi-square tests using Microsoft Excel 2007 software. Results: Of total 130,920 donors, 114,214 (87%) were voluntary and 16,706 (13%) were replacement donors. Male donors predominated, 128,781 (98.37%) male and female 2139 (1.63%). Average seropositivity of HIV, HBsAg, anti-HCV, syphilis, and malaria was 0.10%, 1.60%, 0.18%, 0.89%, and 0.04% among all donors. Significant difference (P < 0.001) in the seropositivity of HIV, HBsAg, HCV, and syphilis was seen between voluntary and replacement donors. Seroprevalence of HIV, HBsAg, HCV, syphilis, and malaria was 0.08%, 1.56%, 0.13%, 0.71%, 0.03%, and 0.25%, 1.90% 0.51%, 2.12%, and 0.04% in voluntary blood donor and replacement blood donor, respectively. Conclusion: Comparing a retrospective data over a long period showed decreasing trend in seroprevalence of HIV, HBsAg, anti-HCV, syphilis, and malaria. Results of the study reflect the prevalence of these infections in the healthy population and warrant measures that should be taken to detect these infections and prevent transmission. Aim: This study was designed to evaluate the effect of β-asarone on diethylnitrosamine (DEN) induced and phenobarbital-promoted hepatocellular carcinoma in rats. Materials and Methods: The experiments were carried out with two models, i.e., tumor initiation and promotion model. The effect of β-asarone was evaluated by the estimation of food and water consumption, body and liver weights, liver function indicators such as aspartate aminotransferase, alanine aminotransferase, alkaline phosphatase, total and direct bilirubin, cancer indicators such as alpha-fetoprotein, DNA, RNA, and total liver protein content, and histopathological studies. Results: The results showed that the levels of liver function indicators were brought down to near normal level by β-asarone. Similarly, cancer indicators were also brought down to near normal level by β-asarone. 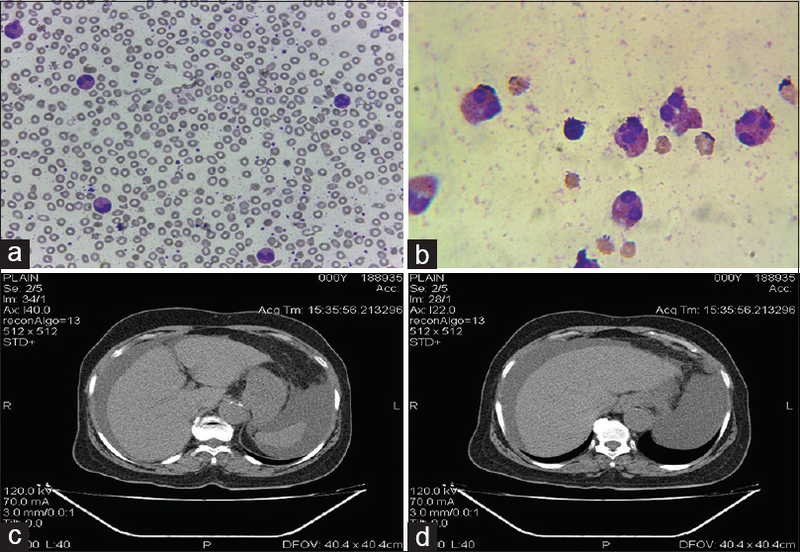 A comparative histopathological study of liver, treated with β-asarone exhibited normal architecture, which was found to be disrupted in DEN-treated rats. 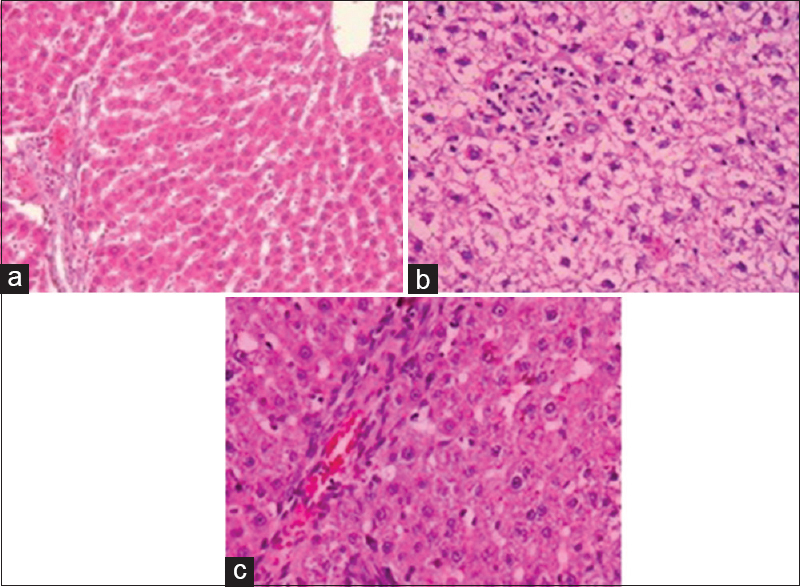 Conclusion: The results indicate that the β-asarone has significant hepatoprotective effect and may potentially possess an anticancer activity. Background: Methanolic extract of Napoleona imperialis, was evaluated for anti-inflammatory effect. Method: Inflammogens used were carrageenan, histamine and formaldehyde. Napoleona imperialis (200-600mg/kg) was administered orally 30 minutes before the induction of inflammation. Diclofenac (10-100mg/kg) and chlorpheniramine (10-100 mg/kg) was administered intraperitoneally. 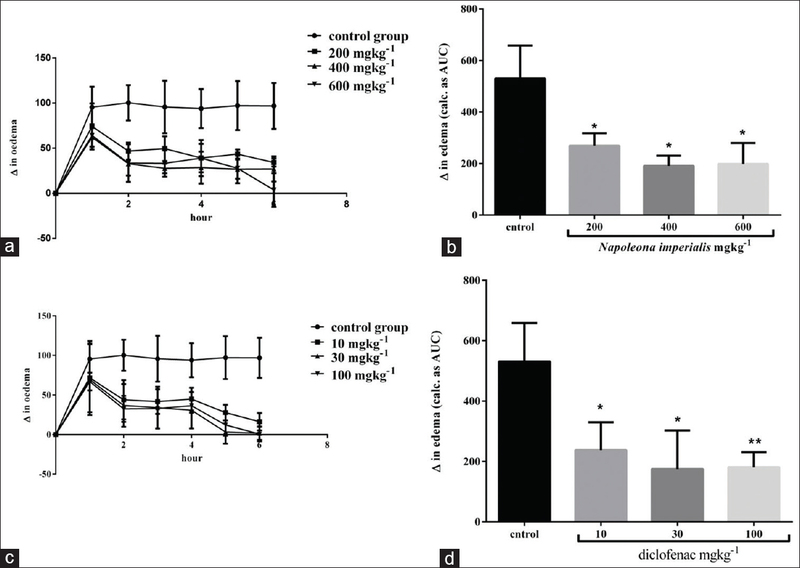 Results: Extract and Diclofenac significantly (F4, 12=15.55, P<0.01; F4, 12=13.76 P<0.01, respectively) inhibited inflammation induced with carrageenan, with extract's maximal inhibitory effect of 64% at dose 400 mg/kg. Diclofenac showed maximal inhibitory effect of 67% at dose 30 mg/kg. Extract and chlorpheniramine significantly (F4, 12=22.14, P<0.01; F4, 12=16.81, P<0.001, respectively) reduced histamine-induced edema with extract having maximal inhibitory effect of 73% at 200 mg/kg. Chlorpheniramine also had maximal inhibitory effect of 70% at 10 mg/kg. Extract and diclofenac significantly (F3, 16=11.06 P<0.001; F3, 16=22.4 P<0.0001, respectively) reduced acute phase of the formaldehyde-induced arthritis. Extract produced maximal effect of 67% at 200 and 400 mg/kg. Diclofenac had a maximal effect of 85% at 100 mg/kg. The chronic phase was ameliorated by extract and diclofenac significantly (F3, 16=11.18 P<0.001; F3, 16=18.07 P<0.0001, respectively). Extract and diclofenac also significantly (F3, 24=19.38 P<0.0001; F3, 24=59.89 P<0.0001, respectively) minimized progression of inflammation from acute to chronic phase. Extract produced a maximal effect of 83% at 400 mg/kg at chronic phase. Diclofenac also had maximal effect of 98% at 30 and 100 mg/kg. Extract and diclofenac, significantly (F4, 12=5.09 P<0.05; F4, 12=31.98 P<0.001, respectively) reduced arthritic score. Conclusion: This study shows methanolic extracts of Napoleona imperialis leaves have anti-inflammaory effects. Background: Distribution of available manpower in healthcare sector is an important issue to maintain the optimum health status of the community. The study of aspirations of the undergraduate medical students might help to know the future availability of the medical fraternity in various fields and to understand the necessities in the medical education field in Rajasthan State. 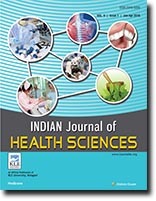 Methods: A cross-sectional study was conducted among 500 undergraduate medical students of JLN Medical College, Ajmer (Rajasthan) in November 2015, using a self-administered questionnaire. Results: There were 65% males and 35% females. About 41.88% students were from rural and 58.12% were from urban background. Average age of students was 21.23 years (±1.89). Majority (87.92%) of MBBS students aspired to do postgraduation. Only 14.17% were interested in a government job in rural and 28.54% in urban areas. Very few (2.7%) students were interested in the research field. Approximately, 8% students wanted to study abroad. Overall specialty preference was internal medicine (31.45%), surgery (15.95%), and Pediatrics (12.07%). Branch preference in females was the same. Nonclinical branches were not the preferred choice among our study participants. The most influencing factors for undergraduate students to choose specialty were job satisfaction and job security (>90%). Unnecessary burden of complicated clerical work instead of clinical job (80.83%) was an important influencing factor for less interest in a government job. Conclusions: Our study shows majority of students desiring to do postgraduation in clinical specialties and most of them want to join urban, socially respectful clinically oriented hospitals instead of a primary health center at the rural area or a nonclinical research oriented specialty. It might lead to shortage of doctors in non- and para-clinical branches and also in rural areas of Rajasthan in future. Context: Undergraduate students are taught, basic procedures of microbiology such as Gram's-staining, Ziehl–Neelsen staining, and focusing of the stained slide using light microscope. It is found that students mostly fail to perform right staining procedures and report a given slide. Aims: This study aims to evaluate the effectiveness of modified Peyton's seven step method to learn basic procedures of microbiology, in comparison to 'see one, do one' method, by a randomized control trial following McGaghie's Mastery learning model. Subjects and Methods: The study group of 45 students was taught by adopting Peyton's seven step method, the control group of 41 students was taught through “see one, do one” method. The performance of the students was objectively measured where in it was evaluated by the faculty. Statistical Analysis Used: Performance was analyzed using Student's unpaired t-test, to determine if there was a true difference between the two groups. Performance at the interpretation station was analyzed using Chi-square test with Yates correction (χ2YC). Results: The study group performed significantly better in Gram's-staining (P = 0.018) and Ziehl–Neelsen staining (P = 0.012) procedures but not in focusing (P = 0.961) and interpretation (P = 0.850 with χ2YC = 0.0356) skills, in comparison to control group. Conclusions: This study proves that a Peyton's seven step method to be effective, in teaching practical skills to students when compared to traditional “see one, do one” method. The modification has components of dyad practice, peer observation, peer feedback, and observational practice. A 19-year-old female diagnosed as asymmetrical axonal sensory neuropathy by nerve conduction study, with the complaints of severe burning, sweating, and pricking type of pain in both the feet more in right foot, for 5 months attended the Kayachikitsa (General medicine) OPD. 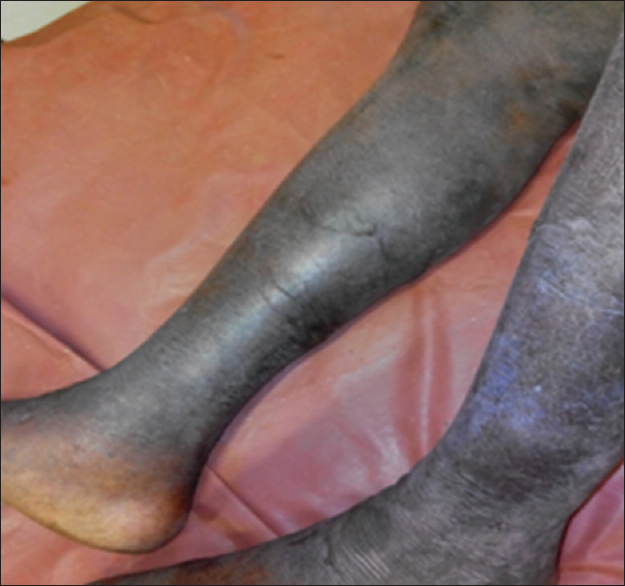 Based on clinical presentation, it was diagnosed as burning feet syndrome, a condition that causes severe burning and aching of the feet, hyperesthesia, and vasomotor changes of the feet that lead to excessive sweating. This condition occurs more frequently in women and usually manifests itself when a person is between 20 and 40-year-old. The pathophysiology of burning feet syndrome is not very clear and treatment varies depending on the etiology. According to Ayurveda, this condition is akin to padadaha. Padadaha is explained in vata vyadhi adhyaya (neurological diseases) where there is an association of pitta and Rakta. In the present paper, we are presenting a case successfully treated with two courses of mrudu virechana (purgation therapy) each of 9 days duration at the interval of 30 days. Then follow-up after 30 days. During follow-up, the patient was on oral medicine. Total duration of the treatment including follow-up was 90 days. After the treatment, the symptoms of burning and pricking pain were completely reduced. Drug-induced cutaneous adverse drug reactions are very much common, especially with antibiotics. Fluoroquinolones are widely used antibiotics for different types of infective conditions. However, dermatological adverse drug reactions to this category of antibiotics are very rare but many times fatal. Bullous fixed drug eruption (FDE), being one of them, is very important to watch for. Here, we are reporting levofloxacin-induced bullous FDE in elderly hypertensive patient. Diabetes mellitus (DM) refers to a group of common metabolic disorders that share the phenotype of hyperglycemia. 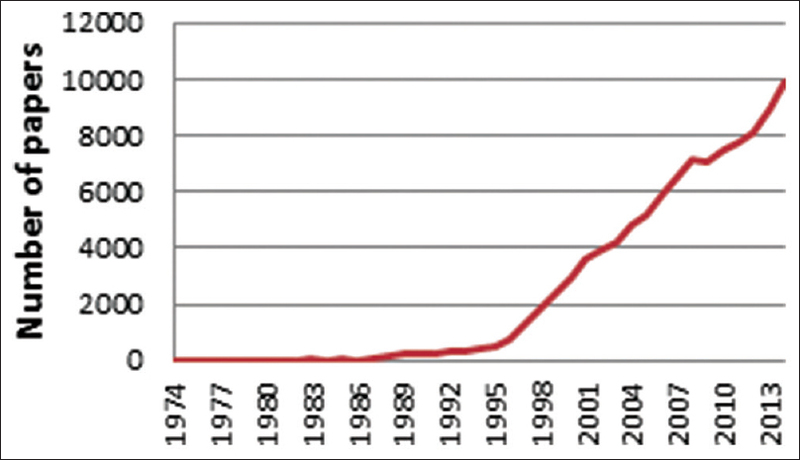 Diabetes is mounting at an alarming rate, all over the world. The International Diabetes Federation predicts that the number of people living with diabetes will to rise from 366 million in 2011 to 552 million by 2030. In spite of all the advances in therapeutics, diabetes still remains a major cause of morbidity and mortality in the world. In such scenario, there is need of establish an alternative and effective therapy to control DM and prevent the complications. DM can be equated with Prameha, explained in Ayurvedic classics. Panchakarma therapy can be implemented in the management of Prameha. Charaka explains it as Santarpanajanyavyadhi and hence, Rukshana therapy is advised for its management. An attempt has been made to assess the role of Rukshana in the management of Type II DM in this case study. An obese female patient of Type II DM was treated with Udvartana for 5 days, followed by Ruksha Basti for 5 days. In result better improvement in subjective as well as objective parameters was observed. 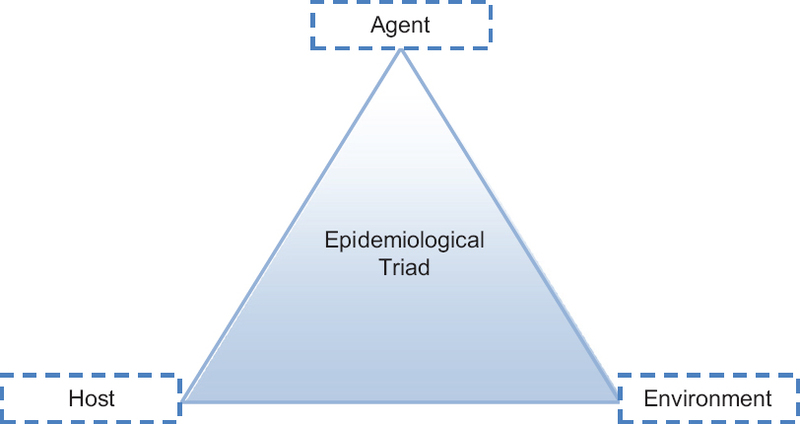 Bathtub shape has important connotations in public health and the concept could be reflected in two novel ways: (1) engineering (2) epidemiological model. 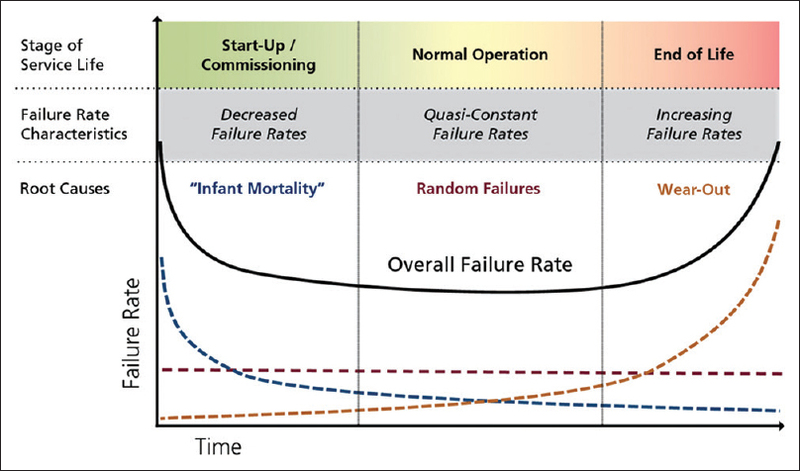 Typical bath-tub curve is a combination of three failure rates, that is, decreasing, constant, and increasing failure rate, and different techniques are utilized to reduce these failures. This brief study highlights the concept of bath-tub, related theory, application, and how data modeling could be undertaken considering bath-tub failure rate. Introduction: All patients have a right to the best treatment for the ailment that they suffer from, and the best treatment usually would be evidence based medicine (EBM). Practice of EBM: This is formulated considering the physician's personal experience, that of the peers and the patients' expectations. In our country EBM is conspicuous in its absence due to poor maintenance of patients' records, poor access to journals and non-involvement of patients in therapeutic decisions. Physicians in private practice are generally not trained to evaluate external experience, whatever is available. Badly designed diagnostic approach and poor quality of information on which therapeutic decisions are based add to factors that prevent the implementation of EBM. Conclusions: In certain conditions patient centred medicine may be superior to EBM. However, patient centred medicine for special situations can only be a reality after EBM has been made the norm for commonly encountered diseases.